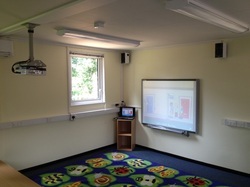 I can undertake any bespoke Audio Visual installation that you may require. I can provide bespoke solutions for wall mounting TV's including chasing walls, hiding all cabling, and even re-plastering ready for decoration. We can provide custom brackets for any unusual mounting solutions. I regularly work on behalf of Schools, Churches, and local businesses to provide custom audio visual solutions for classrooms, business presentations, and Church services to name but a few. I can provide overhead projector systems, TV wall mounted solutions and background music systems to name but a few.